The HERCULES TravLite Trumpet Stand DS410B folds easily and compactly, can be placed inside the bell; velvet pads protect the instrument. 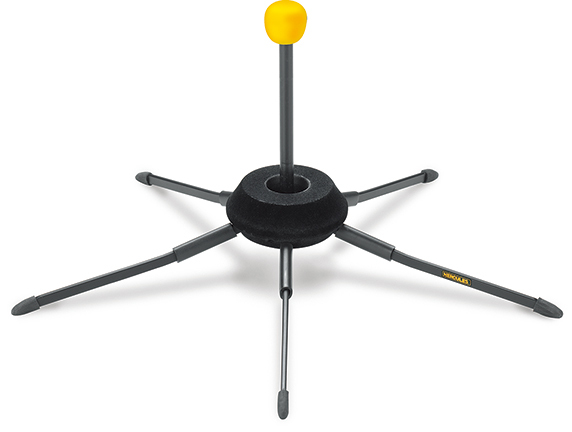 It is easy to set up and provides a strong, stable base for the instrument. 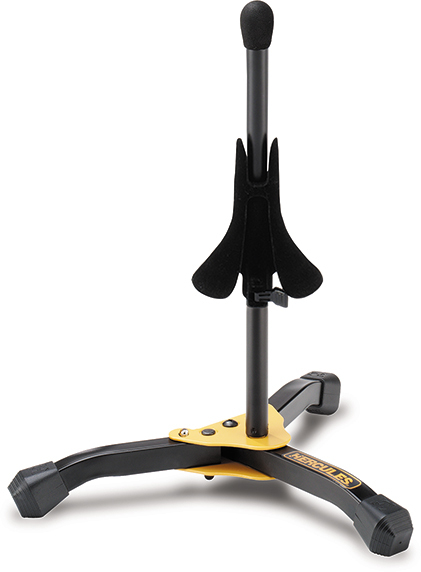 The Lightweight Five-Leg Design is easy to set up and provides a strong and stable base for the instrument. The Compact In-Bell Design allows stand to store safely in the bell of the instrument taking no space in the instrument case. The Velvet Base Design protects the finish of the instrument. The HERCULES Trumpet/Cornet Stand DS510BB features a velvet instrument peg and solid swivel legs for maximum stability. The Height Adjustment Lever adjusts to accommodate different sized instruments. The Detachable Velvet Covered Peg detaches from base for easy transportation, storage and display options. Swivel Legs fit around other equipment easily, and fold up compactly.